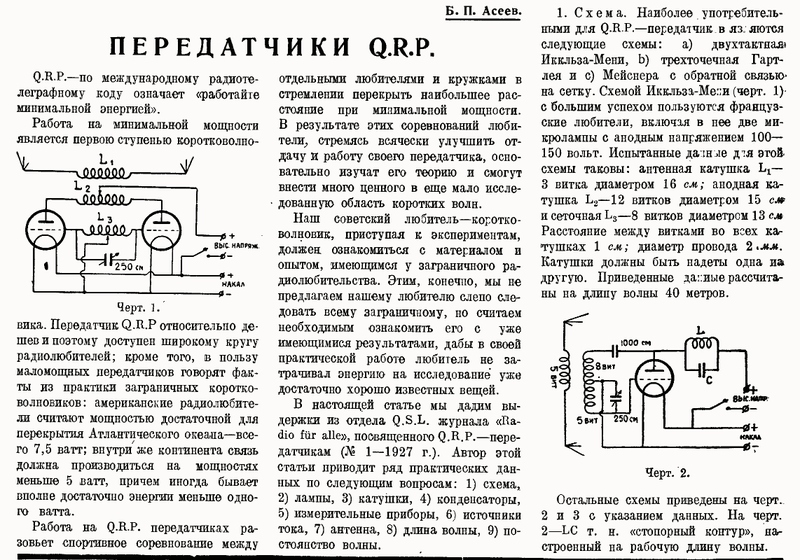 In the following article we'll present some excerpts from the “QSL” chapter of the Radio für alle magazine, which focused on QRP transmitters (January issue, 1927). Author of the cited article offers some practical data on the: 1). 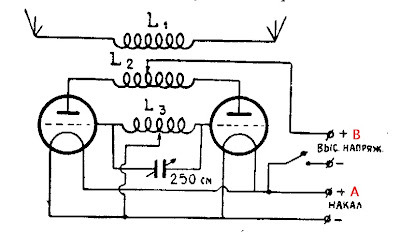 Circuit; 2). Tubes; 3). 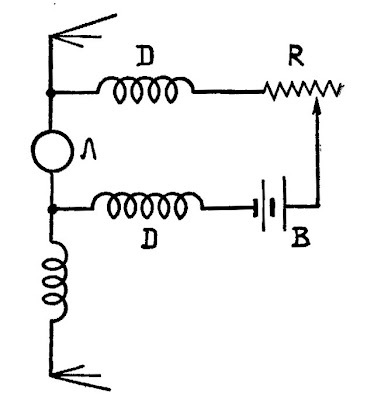 Coils; 4). Condensers; 5). Ammeters; 6). Power supplies; 7). 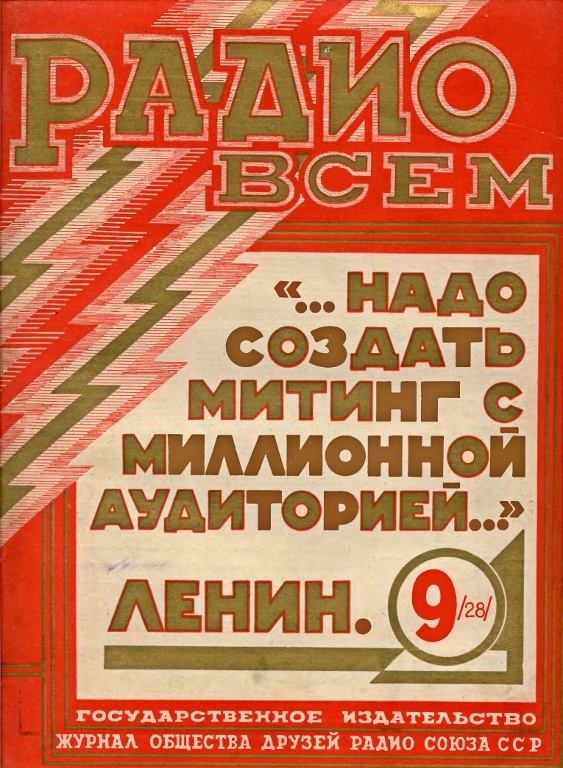 Aerial; 8). Wavelength; 9). Wave stability. 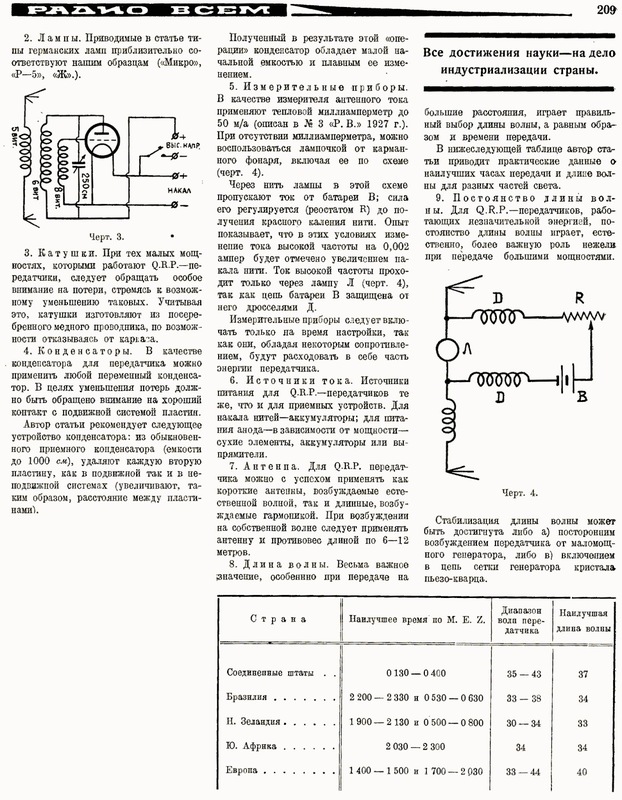 a) Push-Pull by “Иккльз-Мени” (I believe that that circuit is a Push-Pull variation of the famous Armstrong (Meissner) design – tank in the grid circuit unity coupled to the anode coil, which acts as a tickler – quite recognizable. So that it is possible that the second Russian word "Мени" (sounds like "Menie" or "Meny") can be a French pronouncing of Austrian name "Meissner". The first one, “Иккльз”, should be W. H. Eccles, I sure (de UU1CC)). 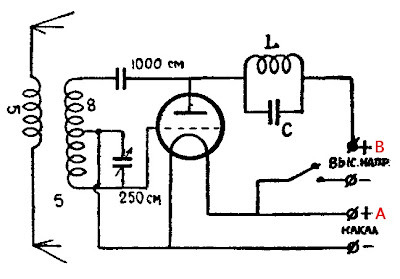 This circuit is used with a great success by French radio-amateurs, which are utilizes pair of common receiver vacuum tubes with 100-150 volts plate voltage. Tested winding for the 40m wavelength: Antenna link L1 - 3 turns, 16cm diameter; Plate coil L2 - 12 turns, 15cm; Tank L3 – 8 turns, 13cm. All coils has 1cm spacing between the turns, utilizes the same 2mm wire and are placed inside each other. With such a low power it is necessary to pay a strong attention to the losses, trying to reduce ones as much as possible. For this reason the coils should be made of silver-plated copper wire, and, it is preferable, air-wound. 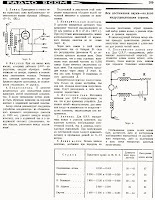 Almost any variable capacitor can be used in the QRP transmitter. In order to reduce losses, the rotor contact should be revised. Author has advised to remove every second rotor and stator plate. Converted that way condenser has a small initial capacitance and smooth action. 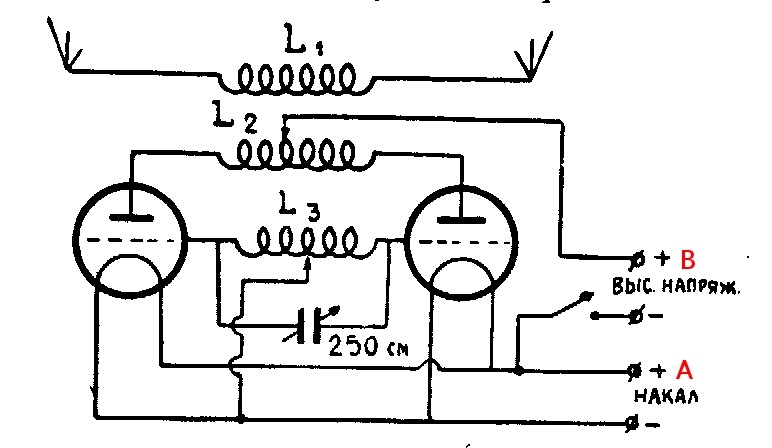 The battery current in that circuit should be adjusted using the rheostat so that the filament glow red. It is tested that even such a small RF current change as 0,002A can be easily observed. The meters wastes part of the RF power and should be used only during the tuning. There is nothing special about the QRP power supplies – almost any power supply should be used. For the filaments – storage batteries, for the plate – dry cells, storage batteries or rectifier, depend on power consumption. 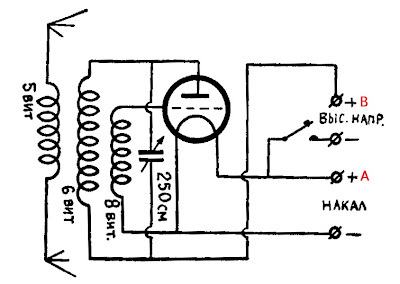 The QRP transmitter can be used with a short resonant (“natural wave”) antenna as well as with a long harmonic one. If antenna is resonant on the base wavelength, aerial itself as well as counterpoise should be 6-12 meters long. Right choice of the working time as well as the wavelength is very important, especially for the distant communications. In the following table author placed practically tested wave and time data for the several parts of the world (note that these data were valid for the German station). Surely, the wavelength stability has much more importance for the QRP transmitters than for the powerful ones. The wavelength stability can be greatly improved using a). 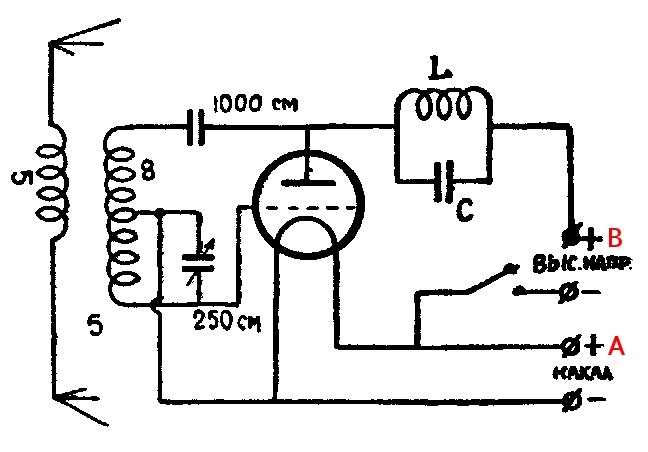 the master-oscillator power-amplifier circuit b). 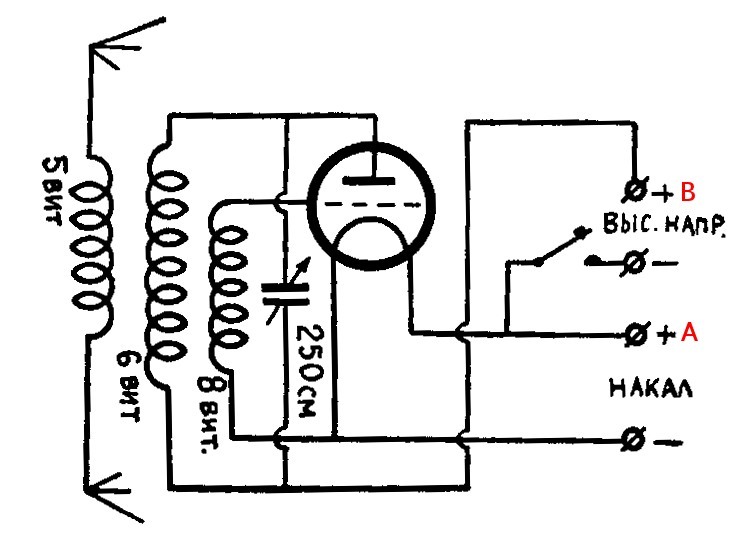 the crystal control in the grid circuit of the single stage low-power transmitter.